Ma, Pa, and Junior live a very simple, ordinary life. While definitely not rich, they have more than enough to get by, and they can count on each other and on their routine. That is why it is such a surprise when a rope bearing the sign “Pull for more” inexplicably appears hanging from the sky outside the house where Ma, Pa, and Junior live. Unable to make heads or tails of the curious rope, the family decides to go inside their home and think about the mystery over supper. During the meal, Pa empties his bowl, but he is just not satisfied. He wants more soup, but there is not any left in the pot. Suddenly, Junior has an idea. He runs outside to the rope, Ma hollers for soup, Pa pulls, and sure enough, more soup—much more soup—falls from the sky and covers the family. 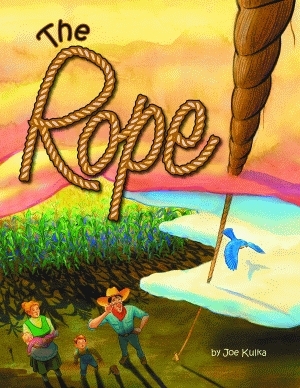 Ma, Pa, and Junior each attempt to pull the rope for something they think they want, only to be most unpleasantly surprised when they get exactly what they asked for. In this innovative and enchanting fable, Joe Kulka pokes gentle fun at the trio of charming characters who find themselves caught up in the fantasy of getting something for nothing when really, they already have everything they need. Complemented by Kulka’s signature lively illustrations, the lighthearted story rendered in playful language is certain to delight readers of all ages in its celebration of family, modesty, and gratitude. Joe Kulka has been working as an illustrator since graduating with a BFA in illustration from the University of the Arts in Philadelphia, Pennsylvania, in 1987. He has worked on the illustrations for medical textbooks, video games, and animated television programs in addition to illustrating numerous children’s picture books. He is the author and illustrator of the award-winning children’s book Wolf’s Coming!, chosen by School Library Journal as one of the best books of 2007 and the recipient of the 2007 Society of School Librarians International Honor Book Award in the Language Arts Picture Book category. He is the illustrator of Granny Gert and the Bunion Brothers, available from Pelican. An avid fly fisherman, Kulka lives with his wife and children in Quakertown, Pennsylvania.